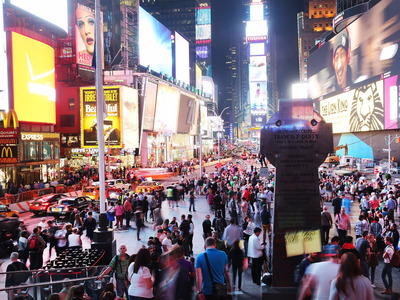 The ads in Times Square are known as an attraction for tourists and a nuisance for locals. But, despite what you think of them, the ads are feats of engineering and are definitely impressive to observe. The ads are massive: The average billboard in Times Square is larger than the average New York City apartment. The average size of the glitzy branded messages of Times Square is 2013.25 square feet, according to data from the Times Square alliance made available on the NYC Open Data website. Meanwhile, the average one-bedroom apartment in New York is a measly 784 square feet. One of the largest ads hangs above tourists in the square site above the American Eagle Outfitters store in Times Square. There are more than 15,000 square feet of advertising screen space on that ad alone, the equivalent of about 32 average sized one-bedroom apartments. Renting one of the giant ads isn’t cheap either. As of 2012, it cost between $1.1 million and $4 million per year to rent ad space in the square. For comparison, the average TV ad run during Superbowl 50 came in at about $5 million for 30 seconds. Living in the city is significantly cheaper, although still expensive, with an average apartment renting for about $78,276 a year according to Blocksy.com. Times Square contains some of the most expensive billboards in the world, and the number of eyeballs available to advertisers is staggering. More than 100 million people pass through the square each year, some drawn only by the bright ads.